NOTE: I updated my pattern upload so it will print correctly!! My 3 Little Pigs Tutorial is so long I had to break it up into two parts. 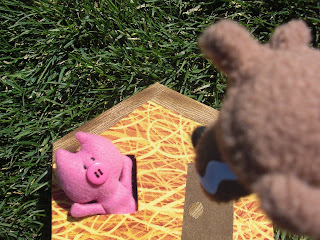 You can find the instructions for the piggies' houses here. 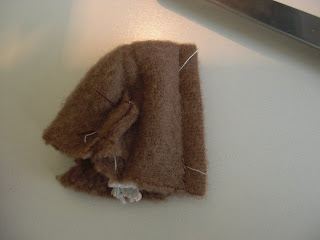 STEP ONE: Fold your fleece right-sides together. (My fleece had one side that was more "furry" than the other, and for the pigs I chose the smoother side as the "right" side.) 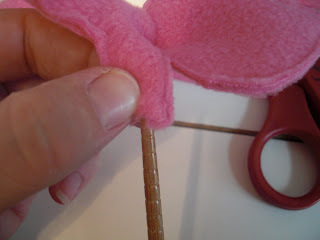 You want the stretch of the fleece to go side to side on your finger puppet, so it will stretch around your finger. 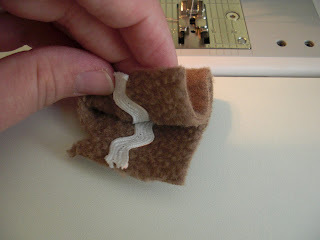 Line your pattern up with the bottom straight edges of your fleece, and sew directly around the outside of your pattern. 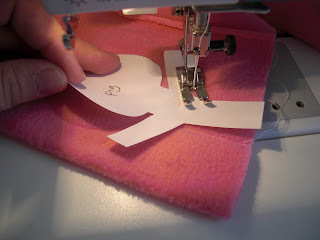 You could also try tracing the pattern directly onto your fabric with a disappearing ink marker if that's easier for you. 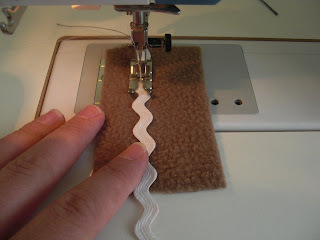 STEP TWO: Cut around your stitching line, leaving a small seam allowance. 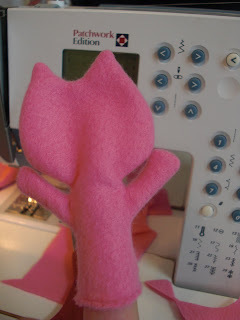 In the area between his head and arm, clip right up to the edge of the stitching, so it will turn more easily. 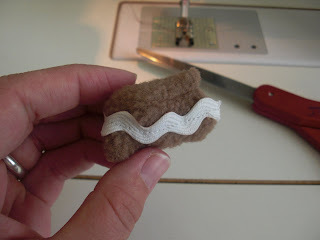 STEP THREE: Turn your finger puppet right side out. Use a chopstick for the arms. This is a little bit tricky, but it can be done. Too frustrating? Try one first, and if it's going to make you insane, re-trace your pattern making the arms a little fatter and sew again. STEP FOUR: Stuff piggy's head. (No need to stuff those skinny little arms!) 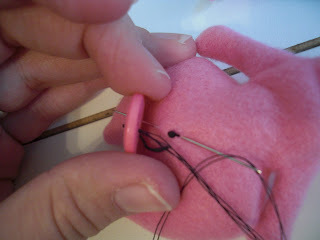 Double-thread a hand-sewing needle with black thread and sew on piggy's nose. Hide the knot under where the button will be. Go up through one hole and down through the one below to make a "nostril." Pull your needle out underneath your button, as shown in the photo. 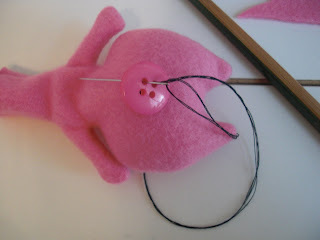 You will then poke the needle into piggy's body and across and come back up where the first button's hole is, then out through the hole.. Repeat a few stitches, then do the same on the other side. 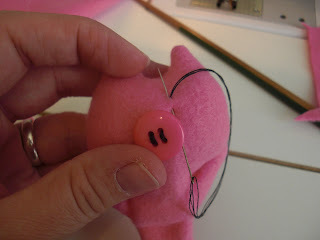 STEP FIVE: After piggy's nose was secure, I tied a knot under the button, then stuck the needle down through piggy's face right next to the knot and came back up where I wanted his eye to be. 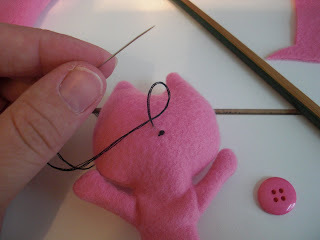 I looped a stitch a few times to make his eye, moved on to do the next, then went back down through piggy's face and up under his button nose to hide the final knot. 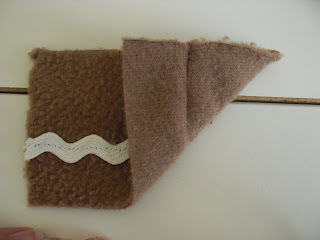 Fold your rectangle as shown in the photo, and stitch straight down across that corner triangle about 1/2" from (and parallel to) the line of stitching that is holding on his rick-rack teeth. Repeat on the other side of the rectangle. Open, and fold right-sides together. 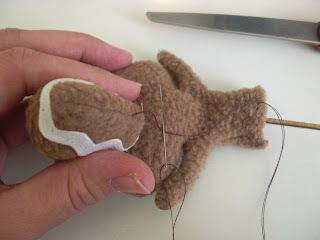 You will now stitch a line along the bottom of your rectangle (the side where the rick-rack is CLOSER to the edge) to create the bottom of wolfie's chin. STEP SEVEN: Turn wolfie's snout right side out and stuff it with a small amount of fiberfil. 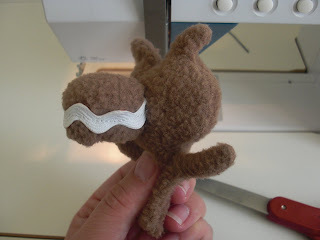 STEP EIGHT: Attach wolfie's snout to his head. Ta-Da! Now you just need to add eyes and a nose. For one of the wolves I made, I stitched little yellow eyes the same way I did the pigs' eyes. Attach a black bead for his nose. 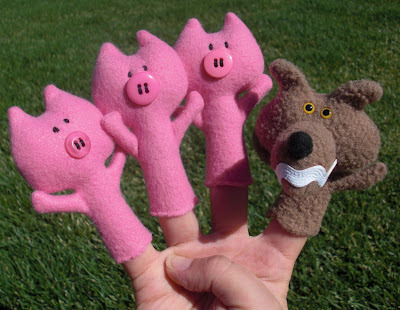 Now you just need to build some houses, and you'll be ready for some 3 Little Pigs storytime action! Hee hee, they're so adorable. Definitely going to have to do this tomorrow. These little piggys make me giggle everytime I see them. Too cute! These are awesome! Definietely going to have to try this! What an adorable project! I love the buttons for their snouts. Perfect use of ric-rac. What cute little piggies. If you make a Little Red Riding Hood and a grandma, you could use the wolf in both stories. I can't stand it! I have to have them they are so cute!! I will be making several sets of them for my crew for Christmas, thanks so much for the sweet idea! I am breathless thinking about how my second graders are going to love these. I don't think I will be turning them inside out. Seams on the outside are just fine for this teacher! Thanks so much for this! My little guy loves them! I linked this idea on myskinnypurse.blogspot.com because I love it! Congratulations, your tutorial is AMAZING!!!! Thank you for this awesome tute! I featured it on my blog in the sidebar! Crud. I just cut my little piggy bodies out and came to read the tut to see what to do next! Urgh. what a wonderful idea! i may have to try this! Has anyone made these? I am trying and trying and cannot get the wolf's nose to work. I may be reading/understanding the instructions wrong. Help! This is super-cute! I am definitely doing this as soon as I get some time. Thank you soooo much!!! oh your idea is so great - and the pigs are so sweet! if you want to visit my site - you are always welcome to me! I love this! 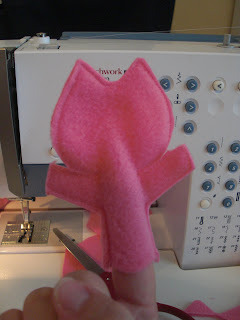 I am featuring this on my sewing blog today when I feature a list of sewing crafts for kids! Follow our signals today & profit up to 270% daily. Love this!!! Please make more!!! :) Hurry to get expertessay writing help online in the best writing service. Very useful information for people, I think this is what everyone needs. want to pay someone to do my homework .